There are three courts in the land: the court of justice (Judicial branch of government), the court of public opinion (i.e., news media), and the Vaccine Court. The first two courts are public. The third is private. Because the Vaccine Court is hidden out of sight, most people never learn of its existence. Why Hide a Court Unless You Have Something To Hide? The Vaccine Court is a federal court, without a jury, run by Special Masters that pay out compensation in millions of dollars each year to families of vaccine-injured casualties. Families have a statute of limitations of 3 years from the onset of symptoms for injuries after the administration of a vaccine. In the case of death, only 2 years. Is justice served when parents make their case against government attorneys of the Justice Department in a government-run courtroom? Normally, when a product fails, the burden of proof rests with the manufacturer. However, in Vaccine Court, the burden of proof rests squarely on the family to show a connection between cause and effect. Proving such a connection is not easy since diagnostic criteria by the American Psychiatric Association has changed several times. Cases can take 2 to ten years to resolve. Therefore, recipients of financial awards represent only a fraction of petitioners, and a smaller fraction of actual vaccine injuries that happen every day. A total of $3 billion has been paid out to families since 1989 and more than $120.4 million has been paid to cover attorneys’ fees and other legal costs. All awards are funded by an excise tax on vaccines imposed on each dose of a vaccine set by the CDC, paid for by the taxpayer (i.e., the injured party). Most families who suffer injury or death from vaccines have at least two things in common: 1) they were denied informed-consent by their doctor (package insert) so they could not make an informed-choice, and 2) they were not told that any adverse reaction should be reported by a doctor to the Vaccine Adverse Event Reporting System (VAERS), the database that compiles information on each vaccine injury and death. Without informed consent, parents feel rushed to judgment. They do not know that combining childhood vaccines at one visit is not safe. They do not learn that each vaccine contains multiple antigens (i.e., pneumococcal vaccine contains 13 antigens), carcinogens (formaldehyde), antibiotics, fetal tissue cells, and heavy metals (aluminum, mercury). They are not told that since 1990, the VAERS database has received more than 500,000 reports of suspected adverse reactions to vaccines. Or that VAERS is a passive reporting system that reflects a 50-fold underreporting of adverse events representing only 1% of actual events. Without real information, parents do not question the growing vaccine schedule deemed “safe and effective” and Congress has no incentive to abolish a Vaccine Court that serves to hide the truth about a growing vaccine-injury epidemic. The media is complicit in hiding the truth and downplays the “so-called vaccine court” to dismiss legitimacy of vaccine damage, as seen during a CNN interview with Dr. Jon Poling, the father of Hannah Poling, the first award recipient of the Vaccine Court to receive a lifetime settlement of $20 million and a one year sum of $1.5 million. The ruling stated that Hannah’s diagnosis of autism, encephalopathy and seizures was caused by vaccines. Since Hannah’s case, 83 cases of vaccine-associated autism have been settled in federal Vaccine Court but were never reported in the media. In March 2015 the government removed the latest vaccine injury court statistics (data from 2014 and 2015) from a public chart, which no longer reflects the rise in court payouts. 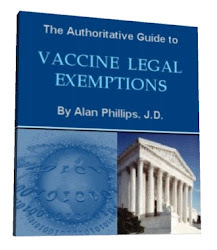 The Vaccine Court’s first landmark decision came quietly in 2010 based on the strong association between the vaccines Hannah Poling received at 19 months (five vaccines — diphtheria–tetanus–acellular pertussis, Haemophilus influenzae type b (Hib), measles–mumps–rubella (MMR), varicella, and inactivated polio) and the autism she subsequently developed. Autism is a broad label for neurologic and psychological impairment which is now an epidemic, with 1 in 45 kids diagnosed, and 1 in 10 with ADHD. Trends show that by 2025, half of all children will be diagnosed on the autism spectrum. Hannah’s signs included problems with language, communication, and behavior — all features of autism spectrum disorder. The court’s ruling read: “encephalopathy caused by a mitochondrial enzyme deficit.” Encephalopathy describes loss of brain function or activity and is listed as an adverse effect on the package inserts of many vaccines, including the ones Hannah received. The CDC and government continue to push vaccines as “safe and effective” even while they can point to no double-blind, placebo-controlled studies that science uses as the Gold Standard for safety and effectiveness. The CDC promotes vaccines as necessary for “community immunity” (which replaces “herd immunity”) even thought it purchases vaccines from the industry it regulates. A conflict of Interest. In 1986, under pressure from the pharmaceutical industry, Congress established a no-fault compensation system for children who suffer vaccine injury or death. The NCVIA resulted from a flood of lawsuits in the wake of the TV special, Vaccine Roulette, that presented evidence on the dangers of the DTP (diptheria-pertussis-tetanus) vaccine. See list of ingredients in DTP vaccine, and others, here. The liability to Big Pharma had become too great relative to the potential profit, so Congress obliged (i.e., blackmail). The CDC pushes vaccine mandates even as its own lead researcher, William Thompson, PhD blew the whistle on the corruption, manipulation, and destruction of data used to conceal the link between autism and the MMR vaccine. CDC documents have been released by William Thompson for anyone to review and research, including Congress, which has a copy. Meanwhile, CDC continues to block Dr. Thompson from testifying. More whistleblowers: Vaccine maker, Merck, is in court facing allegations of wrongdoing from two former Merck scientists who blew the whistle in 2010 on federal charges of fraud for fabricating results in its vaccine studies. In April 2016, a whistleblower filed lawsuit against CDC for major data errors in autism rates. In September of 2016, CDC demoted another employee whistleblower for concerns on the accuracy of the Zika test. Against its own Constitution, California law (SB277) now mandates all children who attend public or private school to adhere to the CDC childhood vaccination schedule (49 doses of 14 vaccines by age 6 or 69 doses of 16 vaccines by age 18) or be refused an education. California serves as a test-market for similar unconstitutional legislation being fast-tracked across the country. To cover all bases, the Federal government has plans for cradle-to-grave vaccine schedules to mandate all adults, including seniors, to roll up their sleeves to “catch up on their vaccines” under the Healthy People 20/20 Act. Under pressure from state medical societies, which get their marching orders from the American Medical Association (AMA), many State legislators have begun removing personal and religious vaccine exemptions, which means a medical doctor is required to sign off any vaccine waivers (i.e., medical exemption). Since 1986, restrictions have increased to where now almost no medical condition qualifies for a medical exemption, as seen under the guidelines of California law. This is a clear example showing government as a corporate entity working for industry at the expense of the people, i.e., a rogue government. Do You Own Your Body Or Does The State? The latest recommendations target pregnant women and fetuses (in utero vaccines) though such vaccines have never been tested for safety to mother or fetus. Nonetheless, under Senate Bill S2742, the developing child is considered a “person” eligible to receive vaccinations. Pregnant mothers are already offered TDaP, flu, and hepatitis B vaccines. This begs the question, what is a “person” exactly? If we do not refute all Acts of Tyranny, we consent to them, even if we are ignorant of the law. It is the same with data and information. Data presented by groups with an agenda only present their “stamped and approved” version. The CDC does not perform studies comparing vaccinated to unvaccinated kids because they would discover something that is becoming very apparent; that vaccinated kids have an increased risk of chronic disease and cancers. There is no justice found in courtrooms that lack compassion. However, there is compassion embodied in each of us. As evidenced by public vigils and marches, parents of vaccine-injured kids are coming together in compassion and love to opt out and withdraw consent even if transparency and justice will never be realized under a rogue government. With access to independent, scientific studies, parents are gathering the data themselves. A recent report by the MOM STREET JOURNAL finds the Vaccine Court payouts for damage from the flu shot alone “from $4.9 million in 2014 to $61 million in 2015 — an increase of more than 1000%.” Other online sites that makes research to do your own investigation include: VacTruth.com, National Vaccine Information Center, vaxxed.com , greenmedinfo.com. Why do flu shots appear more dangerous than others? Perhaps it is due to high levels of neurotoxic aluminum and mercury. Perhaps it is the new mandates in California that require the jab of all children in the educational system. Perhaps it is the policies of hospitals that mandate annual flu shots for all healthcare workers across the country. Perhaps it is the rules of nursing homes and Assisted Living Centers that mandate flu shots for all residents. In all cases, mandates are tied to Obamacare, which is written by the pharmaceutical industry and the insurance industry. Flu shots do more damage (with heavy metals, detergents, antibiotics) than getting the flu. Flu is the result of a suppressed immune system. There is no “flu virus” that is ever tracked since any influenza virus is always mutating before a vaccine can be developed. Flu is a condition of symptoms from infection due to toxins, yeast, pathogenic microbes (bacteria), etc. If people stopped lining up for the flu shot, hospitals would fall in line. Because the current government structure is a product of industry, it is unlikely Congress will ever change the laws written by these same industries. Draconian laws serve to repress and restrict freedom to choose for those who consent. Unjust laws are mirrors to show us what we tolerate and what we do not. By allowing authoritarian dictates or politicians to choose for us, by proxy, we give up our energy and our power as individuals with free will. Each of us is responsible. Forced mandates have no place in a free society. When mandates come in the form of toxic injectables, it is no different than a sanctioned mass poisoning of the population. When liberty and health are threatened based on a foundation of contradictions, it provides an opportunity to stand up for individual rights, where no one else will, and say NO. When enough of us stand together, mass consciousness shifts. Dictates can no longer be used as a tool to enslave. As individuals united, we become the majority and create change with our intention. No one can force, intimidate, or coerce another unless consent is given. Our collective power is grounded in individual intent and consent, and in the knowledge that we are body, mind, and spirit, not only a physical body to be manipulated. We forget we are beings with free will who live on a free-will planet. Free will is a combination of free choice and will power. It is a birthright. It is an inherent ability not only to choose between an apple and an orange, but to decide not to eat either of them because they both contain poison. When we allow our bodies to be herded like cattle, we lock our own gates from within. Freeing ourselves starts with taking the bull by the horns and seeing ourselves as energy first and foremost, unique, with our own distinct fingerprints, our own sensibilities, and our ability to choose a road paved with love instead of fear. When we come together irregardless of creed, color, gender, and unite as powerful, free will beings, we create change. We only have to remember who we are. Rosanne Lindsay is a board certified Naturopathic doctor, Tribal healer under the Turtle Island Provider Network, Earth Keeper, liberty-lover, writer, and author of the book The Nature of Healing, Heal the Body, Heal the Planet. Find her on Facebook at Natureofhealing and consult with her at natureofhealing.org, where this article first appeared.